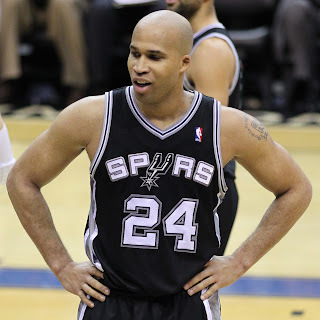 It was announced recently that the San Antonio Spurs will put the amnesty clause to use and cut forward Richard Jefferson from their roster. He is owed $30 over the next 3 years, which the Spurs are still obligated to pay, but they do not have to pay any luxury tax, and it comes off the salary cap, meaning they could make a splash in free agency. The Spurs are after Caron Butler, Shane Battier and Josh Howard, and cutting Jefferson is an indicator that the Spurs are serious in their approach to the aforementioned players. Therefore, Jefferson might be more willing to accept a pay cut to join a contending team. He averaged 11.0ppg and 3.9rpg in his second season with San Antonio, which appears statistically worst than his year with the Spurs in '09-'10. His scoring, rebounding, assist, block, steal, turnover and foul averages were all slightly lower last year, while his shooting percentages improved, his 3 point shooting in particular. In '09-'10 Jefferson averaged 0.316% from deep, making only 59 of 187 shots from beyond the arc. Then last season, that sky-rocketed to 0.440% which was good for 4th in the NBA, tied with Luke Ridnour and Mike Bibby. Additionally, this wasn't a scenario of Jefferson improving his shot selection and appearing dominant from 3; a situation present with Grant Hill of the Phoenix Suns, who shot 0.395% last year yet made only 45 shots from deep. Jefferson looked like a completely different player, making an incredible 135 shots out of 307 last season. That makes a new career high for him, with only his one year in Milwaukee coming close in terms of 3 point shooting. Playing with such efficiency questions why the Spurs would let him go, apart from his annual salary, as Jefferson was one of the main reasons they jumped from 11th in team 3 point percentage in '09-'10 to 1st in the league last year. This will bold well for Jefferson as he looks for a new team. Depending on the role he is willing to accept will determine which team Jefferson ends up with. He would drastically improve teams like Boston, Chicago, Dallas, Los Angeles (either), Memphis, Miami, New Jersey, New York, Phoenix, Sacramento or Washington. The success of the Spurs in the regular season might push Jefferson to sign with a contending team, therefore taking a paycut and taking a lesser role. The Celtics, Heat, Bulls, Mavericks, Lakers and Knicks could all give him a good shot at a title, but for a significantly lesser salary. If he is after cash, the Clippers, Nets, Kings, Rockets and Nuggets could all be potential suitors as they need depth at the 2 and 3. Jefferson averages 16.4 points per game for his career, so wherever he signs, that is what he will be expected to do: score and rain down threes. Every team in the NBA could use a player of his calibre, its up to Jefferson to decide which one it will be.